LONDON - The Italian crisis is over, and has just begun. Its dimensions go far beyond Italy; they are now European, even global. The near three-month long improvisations on a theme of governance ended last Thursday with the announcement of an administration headed by Giuseppe Conte, a law professor with no government experience tasked with running a Cabinet controlled by the leaders of the two parties which form that administration — a signal of weak, divided and warring politics at the summit of power for the foreseeable future. It also reveals something deeper: the chronic inability of the Italian state to find a political floor solid enough to undertake the changes necessary to put the country — all of it, not just the wealthy north — on the road to modernization. In Italy’s case, that means a version of modernity which provides for its systems — political, economic, industrial, social provision, policing, security — to work with relative efficiency and transparency, untied to organized crime or networks of corruption. 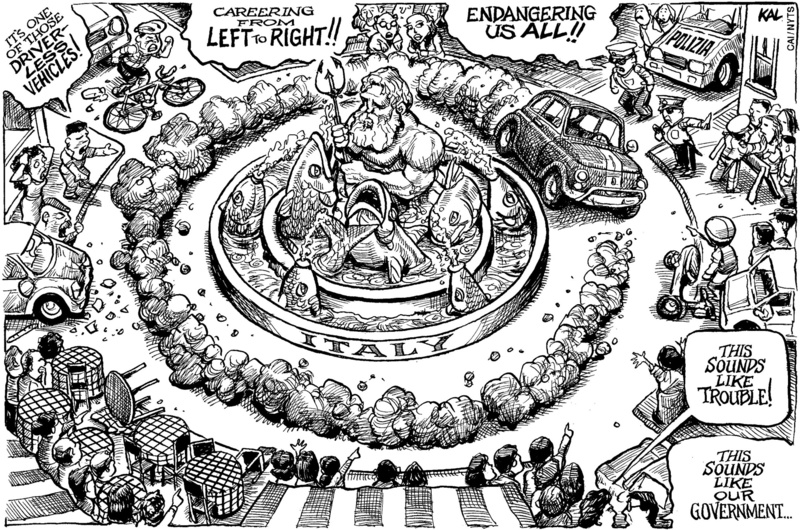 The politicians’ failure to allow necessary reforms has meant, over the past quarter of a century, the demagogic and aimless premierships of Silvio Berlusconi, the floundering of center-left governments, reformist but continually undercut from within their own ranks, and technocratic governments with no popular base and thus limited leverage. The current occupant of the presidential Quirinal Palace, President Sergio Mattarella, had denied the populist parties that won a majority of votes in Italy’s last election entrance to government because he deems them too hostile to the European Union and the euro to be trusted to lead the country. He then reversed that decision after a few cosmetic changes were made, and allowed the first fully populist government in a major European Union state to take over. Mattarella had vetoed the choice for economics minister, the 81-year-old economist Paolo Savona, because the latter had once called for Italy’s renunciation of the euro — a position Savona says he no longer holds. The new governing parties, the anti-establishment Five Star Movement and the far-right Lega (League) then shifted Savona from the economy to the Ministry for Europe — a position in which he will, if anything, be more influential on policy toward the EU than before. Against that was — as the populist parties’ leaders put it — the voice of the people. The voters may fear the loss of the EU, but they are prepared to put euroskeptics in power to get a better deal from it. Maddened by the flows — now much reduced — of hundreds of thousands of desperate migrants crossing to southern Italy in the past two years, and perceiving, not unfairly, that the EU has been strong on rhetoric but weak on assistance, they embrace anti-immigrant rhetoric, hot and strong from League leader Matteo Salvini, with the more sotto voce acquiescence of Five Star head Luigi Di Maio. Italy’s economy, third-largest in the eurozone, is not strong. But it is far from a basket case. The country has huge public debt, but its budget deficit is below the EU target of 3 percent of GDP and its banks are in better shape. Bit by slow bit, with the aid of sometimes painful reforms made by the previous center-left government, it was improving. But bit by bit wasn’t cutting it for voters. An electorate, once fairly equally divided between center-right and center-left, loosed itself from former allegiances and, its mood febrile and angry, sought parties which promised to throw the bit-by-bit bums out and tell the EU to stop enforcing economic austerity on people who think their lives are already austere enough. The Quirinal Palace, which hosted the tortuous negotiations for almost three months, is one of the world’s most splendid. Built in the 16th and 17th centuries by successive popes, the residence of monarchs after Italy’s unification in the 1860s and the president’s residence and office since the monarchy was abolished in 1946, it has 1,200 rooms — almost 10 times as many as in the White House — majestic courtyards, gorgeous gilded ceilings and works of art. It is redolent of past glories, and also of past powers — spiritual and secular. The occupant of these 1,200 rooms, in initially trying to tell Italian voters that their choices are subject to approval by the markets and the EU, lent credibility to the growing mood of dissent within Europe, powered by insecurity, inequality and fear of the future. It was a fundamental mistake, one which strengthened the very forces Mattarella sought to diminish. The Lega-Five Star coalition, which has backed away from a policy of leaving the euro while remaining ambiguous about the future, was in the end, with minimal adjustments, allowed to govern. It will thus come face to face with a difficult reality, and hopefully show the electorate how difficult that reality is, and how little easy answers can help. The government now has to attempt to govern within the constraints of a heavily indebted country with high unemployment, low productivity, pervasive corruption and powerful organized crime networks. It can choose to seek (necessary) change in its relationship with the EU and deliver on those parts of its program which might really assist the low-income voters who were largely its supporters, or try to continue with economically-ruinous policies that would court its own demise. It would be a turbulent choice, but they had won the right to make it. Mattarella’s choice to confront the victors with the presumed power of the EU did not work. 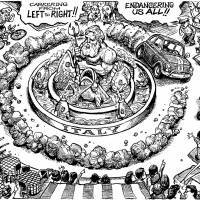 Populism will have its day — which may bring more ruin to Italy and to the union — or may, though this is less likely, introduce a wider understanding that nothing can reform the condition of Italy but Italians themselves.